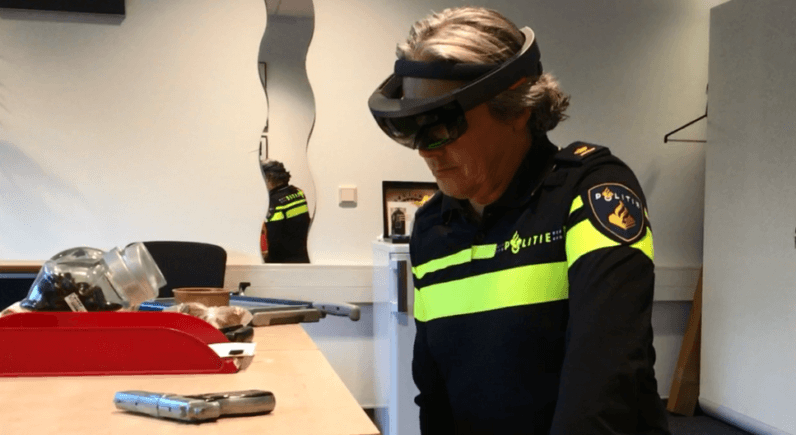 In a future that looks like a weird combination of RoboCop and CSI, the Dutch national police might be using Microsoft’s Hololens in their day-to-day activities. The project is a collaboration between the police force, the Dutch Forensic Institute, the national fire brigade, Delft University of Technology and AR development agency Twnkls. As chief inspector Rob Kouwenhoven told Dutch newspaper AD, there are multiple scenarios in which augmented reality could come in handy. The current set-up consists of a smartphone camera stuck to the officer’s shoulder, and another phone wrapped around their wrist, which can be used to mark evidence or leave notes about a crime scene. The organization is also trying out Microsoft’s Hololens, which could overlay relevant information during forensic investigation, making it easier for investigators to put the puzzle pieces of a crime together. It could also prove useful for courtroom reconstructions of crimes, which currently involves a lot of paperwork and a physical re-enactment of the event. By looking through an AR device, it’ll be easier for the judge to understand what exactly happened through digital animations and explanatory annotations overlaid on the scene of the crime. The police is also exploring the options for patrol officers, who could use the technology as an easy way of navigation by overlaying directions on the real world, or indicating the origin of a call to the local emergency phone number. If everything works out, the police is looking to implement a version of the technology in the coming four or five years.